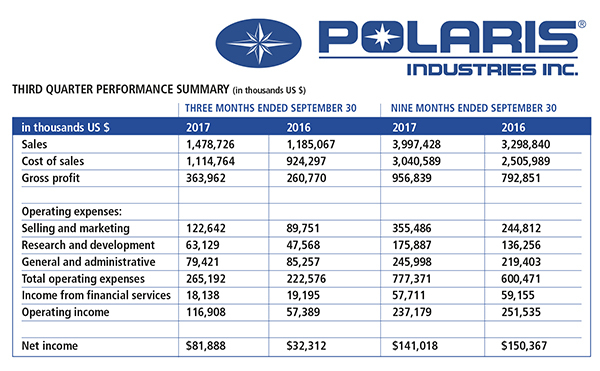 Polaris Industries Inc. has reported third quarter 2017 sales of $1,478.7 million, up +25 percent from $1,185.1 million for the third quarter of 2016. Adjusted sales, which excludes the impact from Victory Motorcycles net sales for the third quarter of 2017, were $1,480.3 million for the 2017 third quarter, up +25 percent. Scott Wine, Chairman and Chief Executive Officer of Polaris Industries, said: “Our emphatic return to profitable growth in the third quarter was a testament to the power of the Polaris brand, the strength of our dealer network and the competitive drive of the Polaris team. During the quarter, strong retail growth in both North America and nearly all of our international markets drove record sales and highlighted our ongoing product innovation, improving product quality and sharpened execution. “We delivered North American unit retail sales growth of +13 percent and overall company sales growth of +25 percent, about half of which was organic, while lowering North American dealer inventory seven percent year-over-year. Results were strong throughout our portfolio, led by Indian Motorcycles’ exceptional performance as they accelerated share gains and outpaced a declining North American motorcycle market, while also delivering strong growth in Europe, Australia and Asia. “I am particularly proud of the improved performance from our Off-Road Vehicle business, which was fueled by a well-planned and executed factory authorized clearance sale and the strong reception of our model year 2018 introductions. Encouragingly, RZR retail sales were especially strong in the quarter, and we had our best ATV retail quarter in two years. “Most importantly, strong total company sales growth translated to bottom-line improvement. Despite higher than expected costs for warranty and re-work and complications from Hurricanes Harvey and Irma, we delivered significant operating profit growth and earnings per share expansion for the quarter. With strong growth in revenue, profitability and cash flow, I feel very good about the performance of the Polaris team and our improved outlook for the fourth quarter and beyond,” said Wine. Motorcycle segment sales, including PG&A, totaled $155.1 million, a decrease of -14 percent compared to $181.2 million reported in the third quarter of 2016, which included $39.4 million of Victory Motorcycle wholegood, accessory and apparel sales. Indian motorcycle wholegood sales increased in the low twenty percent range in the third quarter driven by new product introductions and improving brand awareness. This increase somewhat offset lower Slingshot sales. Gross profit for the third quarter of 2017 was $10.4 million compared to $20.3 million in the third quarter of 2016. Adjusted for the Victory Motorcycles wind-down costs of $7.6 million, motorcycle gross profit was $17.9 million, down from the third quarter last year due primarily to lower Slingshot volume. North American consumer retail demand for the Polaris motorcycle segment, including Indian Motorcycle and Slingshot, was up mid-single digits percent during the 2017 third quarter. Indian Motorcycles increased retail sales +16 percent, partly driven by new model introductions, including the new Chieftain Elite and Limited models and Roadmaster Classic. Indian Motorcycle market share surpassed the ten percent mark in September. Motorcycle industry retail sales, 900cc and above, were down high-single digits percent in the 2017 third quarter. Slingshot's retail sales were down, although the rate of decline decelerated during the quarter. The company has increased its sales guidance and expected earnings per share range for the full year 2017 from previously issued guidance. The company now expects adjusted net income to be in the range of $4.75 to $4.85 per diluted share, compared with adjusted net income of $3.48 per diluted share for 2016. Full year 2017 adjusted sales are now anticipated to increase in the range of 18 percent to 19 percent over 2016 sales of $4,516.6 million. Off-Road Vehicle (“ORV”) and Snowmobile segment sales, including their respective PG&A related sales, were $1,007.4 million for the third quarter of 2017, up 12 percent over $895.6 million for the third quarter of the prior year, driven primarily by improved side-by-side shipments. ORV wholegood sales for the third quarter of 2017 increased +13 percent, primarily driven by strong RZR shipments. Polaris North American ORV unit retail sales for the third quarter of 2017 were up mid-teens percent from the 2016 third quarter, with both side-by-side vehicles and ATVs up mid-teens percent. The North American ORV industry was up high-single digits percent compared to the third quarter last year. ORV dealer inventory was down -12 percent in the 2017 third quarter compared to the same period last year. Snowmobile wholegood sales in the third quarter of 2017 increased +20 percent to $144.2 million due to timing of shipments year-over-year, as the company manufactured and shipped its snowmobiles later in 2016. Global Adjacent Markets segment sales, along with its PG&A related sales, increased +17 percent to $91.6 million in the 2017 third quarter compared to $78.5 million in the 2016 third quarter. Work and Transportation group wholegood sales were up +17 percent during the third quarter of 2017 primarily due to an increase in sales in the company's Aixam quadricycles and Goupil light-utility businesses. Aftermarket segment sales, which include Transamerican Auto Parts ("TAP"), along with the company's other aftermarket brands of Klim, Kolpin, Pro Armor, Trail Tech and 509, increased significantly to $224.7 million in the 2017 third quarter compared to $29.9 million in the 2016 third quarter. TAP added $190.6 million of sales in the third quarter of 2017. Parts, Garments and Accessories (“PG&A”) sales, excluding Aftermarket segment sales, increased seven percent for the 2017 third quarter. All segments and categories increased sales during the quarter. International sales to customers outside of North America, including PG&A, totaled $156.8 million for the third quarter of 2017, up +1 percent from the same period in 2016. Sales in EMEA and Asia Pacific increased low-double digits percent in the third quarter, with Latin America growing sales mid-single digits during the quarter. Gross profit increased 40 percent to $364.0 million for the third quarter of 2017 from $260.8 million in the third quarter of 2016. As a percentage of sales, reported gross profit margin was 24.6 percent compared with 22.0 percent of sales for the third quarter of 2016. Gross profit margins on an adjusted basis improved due to increased volume, lower warranty, significant gross VIP cost savings and positive product mix, somewhat offset by higher promotional costs. Sequentially, adjusted gross profit margins were 130 basis points lower than the 2017 second quarter, primarily due to higher warranty and the added costs from a combination of supply chain and natural disaster related headwinds during the quarter. Operating expenses increased 19 percent for the third quarter of 2017 to $265.2 million from $222.6 million in the same period in 2016, which included $1.3 million in Victory wind-down costs and $3.5 million of TAP integration expenses. Excluding these costs, operating expenses increased primarily due to the addition of operating expenses from TAP, as well as increased research and development expenses and increased selling and marketing costs related to the introduction of new products, offset somewhat by lower legal related expenses. The company reported third quarter 2017 net income of $81.9 million, or $1.28 per diluted share, compared with net income of $32.3 million, or $0.50 per diluted share, for the 2016 third quarter. Income from financial services was $18.1 million for the third quarter of 2017, down six percent compared with $19.2 million for the third quarter of 2016. The decrease is attributable to lower income generated from the wholesale portfolio due to the lower dealer inventory levels. Third quarter gross profit margin was 24.6%, up 261 basis points over prior year. Adjusted gross profit margin was 25.5%, up 351 basis points versus last year primarily due to positive product mix, increased VIP savings and lower warranty costs. Net cash provided by operating activities was $494.5 million for the nine months ended September 30, 2017, compared to $426.2 million for the same period in 2016. Total debt at September 30, 2017, including capital lease obligations and notes payable, was $920.0 million. The company’s debt-to-total capital ratio was 51 percent at September 30, 2017, compared to 32 percent a year ago due primarily to the financing of the TAP acquisition. Cash and cash equivalents were $132.3 million at September 30, 2017, up from $122.7 million for the same period in 2016. During the third quarter of 2017, the company repurchased and retired 257,000 shares of its common stock for $23.3 million. Year-to-date through September 30, 2017, the company has repurchased and retired 1,015,000 shares of its common stock for $88.9 million. As of September 30, 2017, the company has authorization from its Board of Directors to repurchase up to an additional 6.4 million shares of Polaris common stock. To start with You got an incredible blog .I will be occupied with more comparable points. i see you got truly extremely helpful points, i will be continually checking your blog much appreciated.